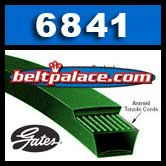 GATES 6841 V-BELT / 4L410-K Belt. 41 inches O.C. - 1/2" Wide. Gates PowerRated V-Belt. GATES 6841 POWERATED V-BELT. 41" Overall Length x 1/2" Wide. GATES 6841 Aramid green belts (Kevlar) are an alternative to conventional light-duty belts, with high performance construction delivering more horsepower, less stretch and providing longer service life. PoweRated® belts are suitable for outdoor power equipment, appliances and industrial applications where Fractional Horsepower (FHP) belts are typically used. 4L410K FHP V-Belt. Aramid/Kevlar Consumer Brand. 1/2” W x 41" Length. Replaces Classical A39K V-Belt on light duty applications.